Hello and wel come to Tamara’s Studio! 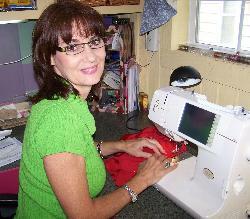 Tamara started designing small sewing projects at the age of 12, and always had a love for fashion. She continued to expand her skills all through those younger years. While in college, the professor of a design class she was taking suggested Tamara design a line of flower girl dresses as a project to be used in a local wedding. Tamara took up the challenge and opened her own custom design bridal store. Later she added custom tailoring to her list of services. While Tamara has had great success over the years, she has discovered that she has a passion for designing hand made purses. She loves designing purses so much that she sometimes wakes up in the middle of the night with a new design idea so good she immediately has to sketch it out. Her passion for design and for hand made quality shows through in every bag and purse she makes. At first, her handbags and purses were only offered in the retail store and sold to local customers. The demand for Tamara’s custom-designed bags quickly grew. Tamara’s handbags were such a success they soon came to be known as Purse Priss bags, and people were calling from all over the country to purchase their own Purse Priss bag. Tamara’s lifetime of sewing expertise did not prepare her for the experience of seeing the expression on a woman’s face when presented with a new Purse Priss handbag. Her couture collection of handbags has been a huge success! The purses are all unique because of the generous number of pockets inside, the exterior embellishments, and the personalized choice of fabrics. Customers are able to make custom selections for their new handbag to match the Purse Priss design. Each purse with its signature interior is made for a contemporary lifestyle with pocket space for a cell phone/PDA, lipsticks, passport, and numerous other accessories. There is no mass production of Purse Priss handbags. These are high, high fashion, and high quality custom made handbags, designed and sewn by Tamara and her personally trained staff right here in the studio. Tamara even gets help from her husband Greg, who helps out in the studio, cutting out fabric pieces and putting on snaps. They love to work together. Tamara is always thinking of the next new design for her handbags, staying one step ahead with designs that are sure to make each woman proud to express herself through such a great accessory – the Purse Priss handbag. Currently, Tamara focuses her attention exclusively to the production of her Purse Priss designs. The Purse Priss line of custom made handbags is now 9 years old and growing! The retail store still offers tailoring of all sorts for local customers, and you can still stop in and talk personally with Tamara about your custom purse design. Are sewing lessons done individually or as a group with group projects? What is cost and are there set times one must join?